70 years is a big deal no matter how you look at it. If you're a human, chances are you've lived a long and happy life. If you're a tortoise, you'll be going through a midlife crisis. If you're a car, then by now you've become a classic. So yes, 70 years is a long time. And 70th anniversary calls for something special. For Vespa, which has been making cult scooters for exactly that amount of time, this means launching a special edition scooter to commemorate its little two-wheeled runabouts. 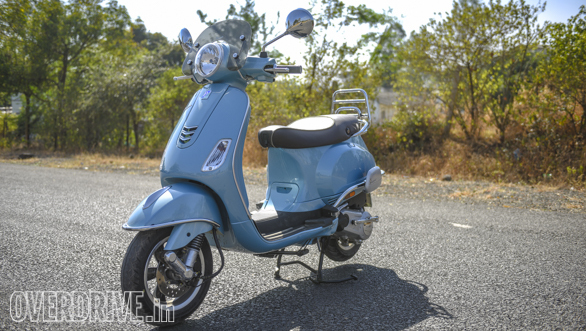 The result is the Vespa 70th Anniversary Edition. What makes the 70th Anniversary Edition so special? The long list of embellishments, of course. Firstly, there is the special Azzurro 70 paint scheme. Then there is the generous splash of chrome all over the scooter. 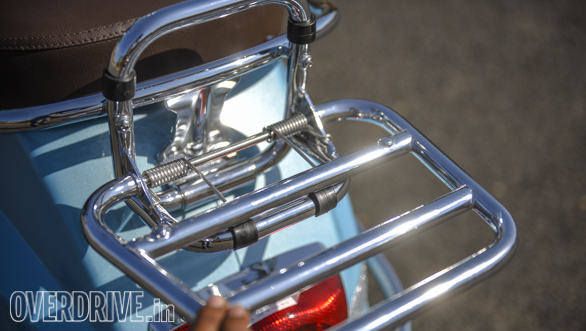 The Anniversary gets a chrome perimeter guard, luggage carrier and a special fly screen. 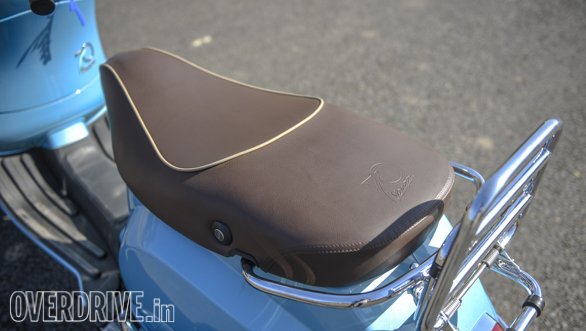 The seat too is finished in brown leather pattern fabric and has a 70th anniversary logo embossed on it. This same logo can be found all over the scooter - in the footwell and on the flanks, but in chrome. The additional bits make it stand out in a way that only Italian scooters do. But personally, I think them to be a bit over the top. But that's not saying it's bad looking. It just doesn't work for me. Underneath it all though is the same VXL 150 that has been on sale in India for over a year. 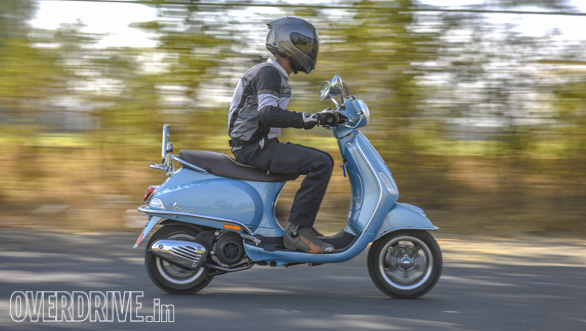 It uses a 3-valve, OHC, air-cooled 150cc single that makes 11.6PS and 11.5Nm. It is a sprightly motor and is quick off the line. It is refined too and at an 80kmph cruise on the highway, it doesn't feel one bit stressed. In fact, it feels quite comfortable at 80kmph and even has enough power in reserve to pull off overtakes. We managed to see near 110kmph on the speedo without too much effort, which means that true speed should be somewhere around 100kmph. The monocoque chassis has always made the Vespas great handlers. The small wheel formula does tend to make them super flickable, and this holds true for the Anniversary too. Direction changes are super fast and you need a measured hand to not overcook it. That said, I'm not a fan of small-wheeled two-wheelers that can go silly fast. 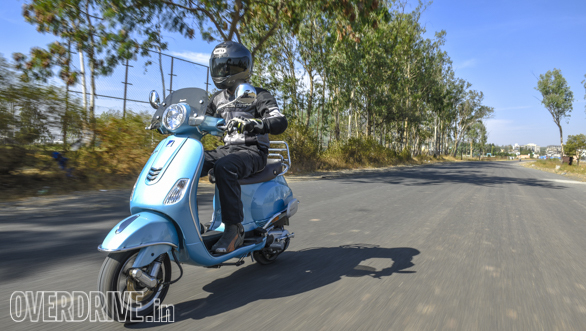 At high speeds, the small wheels make the Vespa very twitchy, and it isn't a confidence-inspiring feeling. The trailing link suspension up front doesn't help matters either. Aside from feeling unsettled at high speeds, it also isn't very pliant over bad roads. In fact, you'll be bouncing around over anything but perfect roads. 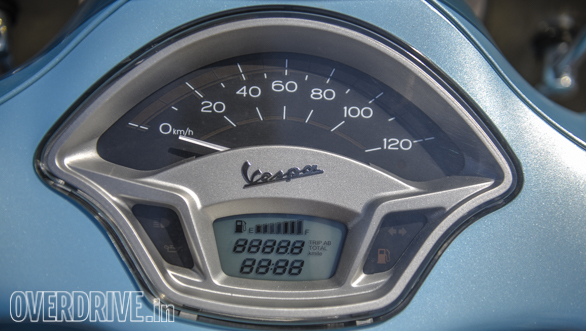 At Rs 1.24 lakh (on road, Mumbai), the Vespa 70th Anniversary Edition isn't cheap by any means. And like all other Vespas, this one too is more of a style statement than a workhorse or a performer - which explains the price tag to some extent. 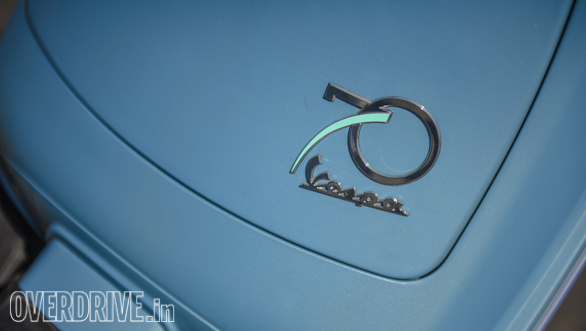 But the real threat for the Vespa now comes from its family. For roughly two-third the price, you get another Italian scooter that is far more exciting and does almost everything, what the Vespa does, better. That, if nothing else, should surely make you think long and hard about the Anniversary.